The office of Keeper was acquired in 1887 by a descendant of the Royal Stuarts, John Patrick Crichton Stuart, the 3rd Marquess of Bute. He rebuilt and restored much of the Palace. His grandson, Major Michael Crichton Stuart and his wife Barbara made it their home after the Second World War. They laid out the gardens and appointed the National Trust for Scotland as Deputy Keeper in 1952. Their son, Ninian, is the current Hereditary Keeper. Technically, the Palace is still the property of the Crown although it is now in the care of The National Trust for Scotland. The Falkland Palace tennis court was built in 1539 for James V and is the oldest in Britain. 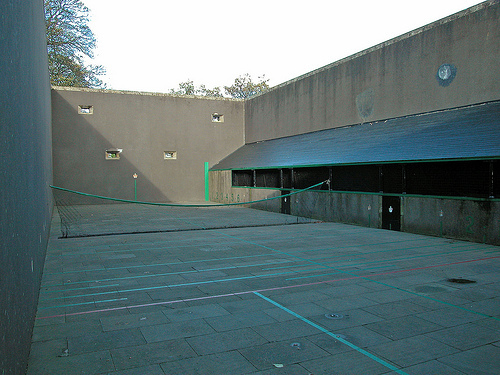 The Falkland court was restored in the 1890s and is the only active real tennis court without a roof. It is believed to be the only jeu quarré court in the world. The main differences from the jeu à dedans court are that it has penthouses on only two sides instead of three, and four window-like apertures (lunes) at the service end walls. 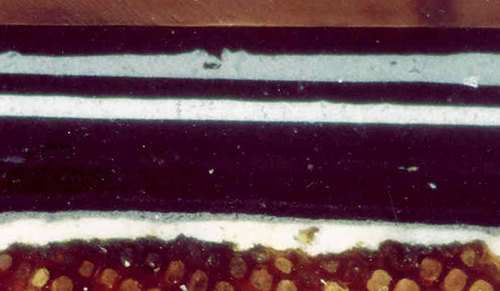 I was commissioned to carry out the paint analysis of the painted elements.